a diorama depicting a scene from the 1895 America's Cup race showing the American yacht Defender with a safe leeward position on the British challenger Valkyrie III shortly after the start. 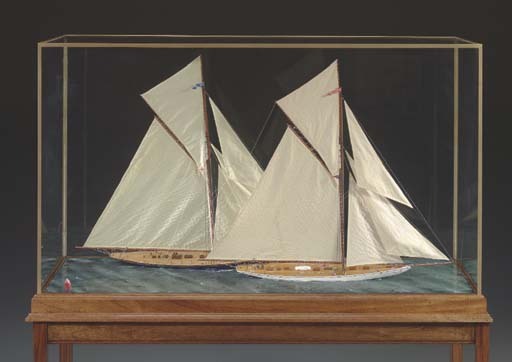 The two models are set in a modeled and painted sea, the hull of each yacht is painted and modeled with a wood deck with the plank seams drawn in India ink. Each yacht is fitted with a single mast and rigged as a gaff cutter including deck details, sails, and rigging. Displayed in a brass bound glass case with a mahogany base and stand.